HCImage is Hamamatsu’s image acquisition and analysis software suite designed to provide a flexible, easy-to-use solution for a wide range of imaging applications. Click on the image below for more information. HCImage Analysis provides comprehensive control of Hamamatsu cameras, microscopes, stages, and other peripheral devices providing the ability to perform multi-dimensional imaging with ease-of-use and flexibility. 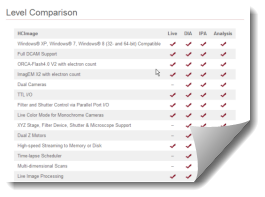 Choose from an extensive range of image processing tools that can be used during live image capture or post acquisition analysis. Data are saved in a hierarchical file structure, allowing dynamic interaction with images and measured data that can be easily displayed in a variety of graphical formats or exported to Excel®.